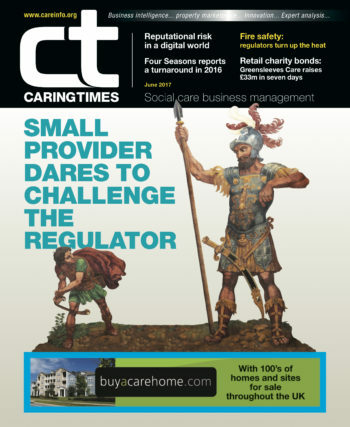 Somerset Care chief executive JANE TOWNSON talks to Tim Barsby, Business Development Director at Carter Schwartz, about her company’s focus on enabling residents, giving their lives meaning and purpose. From an entrepreneurial background of running her own business, Jane Townson’s plan to turn her individual nutrition consultancy into an online network of advice for a better diet was sid tracked by becoming the chief executive of Somerset Care, a not-for-profit provider which operates 29 care homes across the south of England, along with homecare and a range of other support services. “Many years ago people who came into care homes were quite fit,” said Jane. “They’d drive their own cars, bake cakes and food wasn’t such an issue. Now we’ve got very frail, elderly going on 90-plus year old residents with advanced dementia, all kinds of special dietary needs including problems with swallowing and diabetes, so food has become quite technical and quite difficult. Consumer expectations are going up all the time and justifiably – if you’re charging people money for care they want high quality food which is such an important part of the day. Jane said she didn’t want Somerset Care’s homes be like five-star hotels. “I want them to be like a home,” she said. “In hotels people do things for you which is OK up to a point but actually you can end up disabling people which is the opposite of the model of care we’d like to see. Jane said many people in the care sector are obsessed with risk, worrying about what the regulators will say if they try new things that might be beneficial. “When I was in the NHS I was head of whistle blowing and I saw what happened to people that did that and it wasn’t positive. “You need to be focused on a willingness to speak truthfully, openly and honestly. I’ve been shocked to see that some don’t have this focus because there is a climate of fear in the health and social care sector. It has led to a conspiracy of silence where no one is willing to blow the whistle. Jane said her team had found that enabling residents by teaching them how to use skype, Google Earth and email has had a tremendous impact on their wellbeing. Is there something the sector should be working towards together?